Seven men have retracted their confessions a week after police in the Indian city of Mumbai (Bombay) said they had solved recent serial bombings. They told a court on Monday that their admission of guilt was obtained by police bullying and coercion. The court remanded them in judicial custody until 20 October. 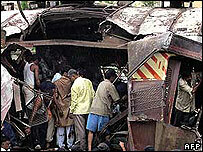 More than 180 people were killed and 700 wounded in the bomb blasts in commuter trains in July. Police arrested 16 "key suspects". Police said Pakistan's Inter-Services Intelligence (ISI) - along with two Pakistan-based militant organisations - were behind the bombings. The lawyer for the seven accused men, Shahid Azmi, claimed his clients were forced to sign on blank papers. He said their signatures were not obtained in the presence of a police officer of the rank of deputy commissioner, which is mandatory under the law. Most of the 16 accused men have been arrested under a law called the Maharashtra Control of Organised Crime Act. The Mumbai police chief said the 11 July case was "solved"
Mr Azmi said the police knew many of the accused men some time before the Mumbai blasts. "They were picked up and let off several times between 2001 and 2006 on suspicions of being involved in the bomb blasts that took place in this period. But they have now been re-arrested under political pressure," he said. Police say they have evidence against all the men arrested, which will be produced in court during the trial. But there were some who expressed doubts over recent police claims that they had solved the Mumbai bomb blasts case, and the finger-pointing at Pakistan's ISI. They say police must produce firm evidence against the accused men which can stand in court. 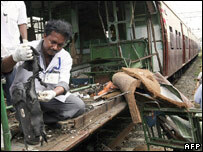 Train blasts: Were you there?